This site requires the latest version of flash, get it for free here. If you believe you have the latest version of flash, bypass the flash detection. Black velvet curtains and booths surround this room making it soft and comfortable. It is located next to our wine bar which can serve as a cocktail room before dinner. This space provides a luxurious environment, with walls decorated in timeless Hollywood news. The Entertainment room seats up to 60 guests. 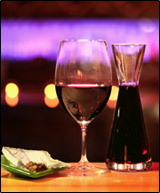 We feature over one hundred and fifty wines by the bottle with an emphasis on New World varietals. Napa Valley reds are the pride of our list with over 20 bottles, including signature wines from Opus One and Orin Swift wineries.